Did you know that many other diagnoses mimic ADHD because they have the symptoms of inattention, hyperactivity and impulsivity? 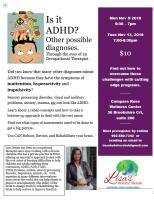 Sensory processing disorder, visual and auditory problems, anxiety, trauma, etc can look like ADHD. Learn about 3 rehab concepts and how to take a bottom-up approach to deal with the root cause. Find out what types of assessments need to be done to get a big picture. You CAN Reboot, Rewire, and Rehabilitate your brain .